ALMA is capable of precise observations at short microwave wavelengths, typically emitted by cold gas and dust. But objects on the edge of our solar system also emit light in this range, and would be too cool and distant to be observed by infrared telescopes. In 2014, ALMA found a faint object in the direction of Alpha Centauri A & B. The object was again observed in May of this year, this time more clearly. 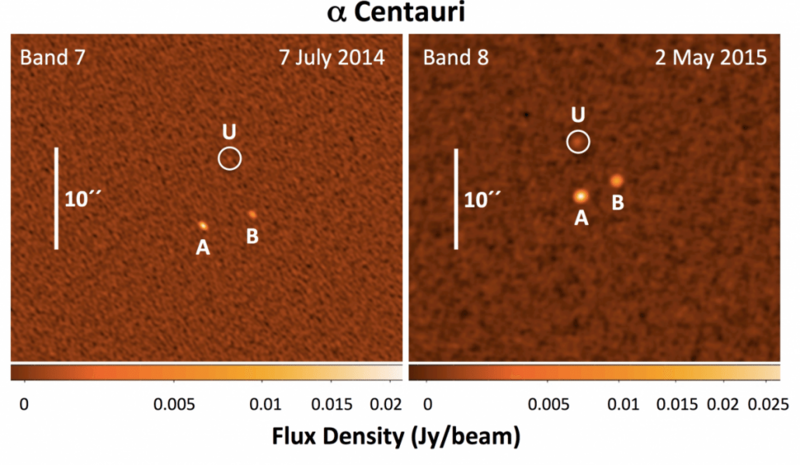 Given that the object is within a few arcseconds of the Alpha Centauri system, it would seem reasonable to presume that it could be part of that system, possibly gravitationally bound as Alpha Centauri D. The Centauri system is about 4 light years away, and at that distance (given the object’s brightness at submillimeter wavelengths) it would have to be a red dwarf star. But such a star would also be clearly visible in the infrared, so if this object is Alpha Centauri D we should have seen it long ago. 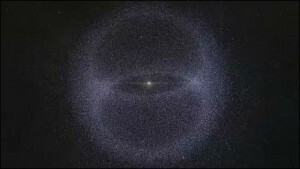 The new object (labelled U) as seen by ALMA. Credit: R. Liseau, et al. Since it doesn’t seem to be part of the Alpha Centauri system, it must be closer and correspondingly smaller. With just two observations it isn’t possible to determine the object’s orbit, so we can only guess at its distance and size. One possibility (and the one I think most likely) is that it’s an extreme trans-Neptunian object about 100 astronomical units away from the Sun, which is further than Sedna at 86 AU. This would make it the most distant known object in the solar system, but likely smaller than Pluto. Another possibility (which seems more likely to the object’s discoverers) is that it is about 300 AU away and about 1.5 times the size of Earth, making it the first “super-Earth” found in our solar system. 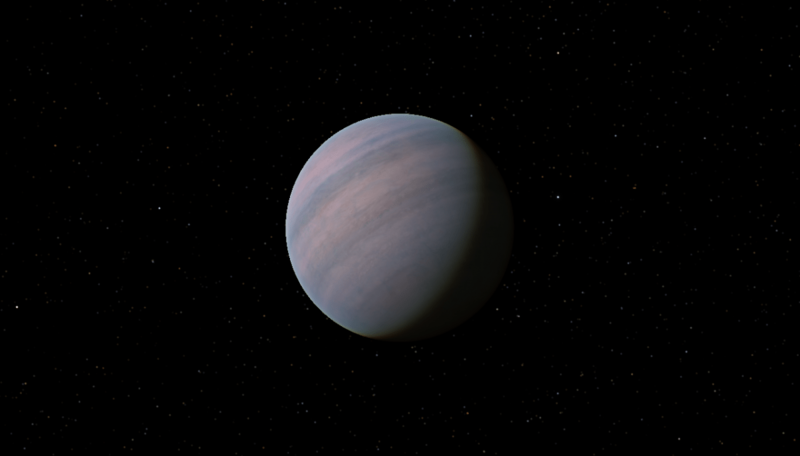 Observations of trans-Neptunian objects have led to some speculation that one or two super-Earth’s could lurk in the outer solar system, so it’s not out of the question. There’s reason to be cautious of this idea, however, because of its location. Alpha Centauri is about 42 degrees away from the ecliptic. Most large solar system lay within a few degrees of the ecliptic, and even Sedna’s orbit is only inclined about 12 degrees from it. The chances of a super-Earth with such a highly inclined orbit seems very unlikely. A third possibility is that the object is a cool brown dwarf about 20,000 AU away. Such an object should also be visible in the infrared, so there would still be the question as to why it wasn’t discovered by earlier infrared sky surveys. It’s proximity to Alpha Centauri would seem to make such an object easy to find. The only way to know for sure is to gather more observations. Either by tracking its motion or by gathering observations at other wavelengths we can eventually get a handle on its size and distance. Whether dwarf planet, super-Earth or small star, it seems clear that something is lurking on the outer edge of our solar system. Fascinating it could be one of so many diverse possibilities! I’ve often wondered how many objects we will end up finding further from the ecliptic. Seems like the more we look the more we find, especially outside the “established norms”. Since this wavelength is emitted by things that are about 10 K or so, I’d say we are looking at a cold rock or ice. If, as the images suggest, it’s variable in this wavelength, that could mean a few things. It could mean that the object is rotating and it has cold side and a colder side. Could also be consistent with object having one or more satellites. Why such a great range of possible distances (100 to 20K AU)? I thought such distances could be readily measured by parallax observation? Saw this today and found it intriguing – could this be the same object?